Chlorsig Eye Ointment (Chloramphenicol) is used to treat eye infections that have been caused by bacteria, such as conjunctivitis. The main ingredient in this ointment is a type of antibiotic, which works by preventing the bacteria responsible for the infection from growing, thereby treating the infection. 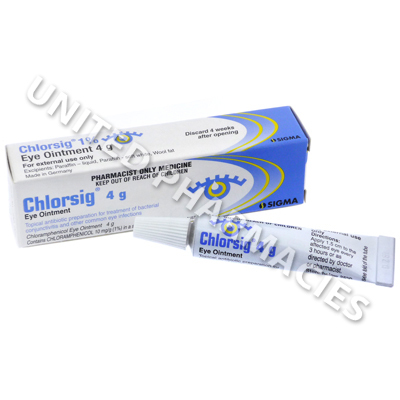 Chlorsig Eye Ointment (Chloramphenicol) is used to treat eye infections that have been caused by bacteria, such as conjunctivitis. The main ingredient in this ointment is a type of antibiotic, which works by preventing the bacteria responsible for the infection from growing, thereby treating the infection. However, it is important to note that antibiotics are only effective for bacterial infections, and will not work for other types of infection. Chlorsig Eye Ointment (Chloramphenicol) is applied directly to the eye. Ask your doctor or refer to the instructions if you are not sure of the correct application procedure. It is very important that you wash your hands before applying the ointment. Your doctor will most likely tell you to pull down your lower eyelid, and to place a 1cm long strip of ointment in the lower eyelid, after which it is necessary to close the eye and move the eyeball around to spread the medication. However, it is important not to blink while doing this. Apply the ointment as often as your doctor tells you. You are advised to tell your doctor about any side effects occur. All patients should be aware of the risk of more serious side effects. Seek immediate medical attention if you notice changes in vision or any other side effects. In rare cases, this medication has causes serious and possibly fatal blood disorders. For this reason, doctors will normally not prescribe it if other medications are available. You should not wear contact lenses while using this medicated ointment. Your doctor will tell you when it is safe to wear them again. Always use Chlorsig Eye Ointment (Chloramphenicol) as you have been prescribed by your doctor. Never self-medicate or change your dosage without first consulting your doctor. The correct dosage can vary depending on your health, medical history, and the severity of the condition being treated.